My last post in the Family History Through the Alphabet Challenge. I am really scraping here. I never lived on or in Zamzeewillie. I’m not even sure that’s how you spell it. My daughter Ayanna was the only one who knew the particulars and she can’t remember. She made it up when we she was about 8 years old. It was around the same time that my then 3 or 4 year old son James became friends with the people only he could see. I was never sure if Nice Helmut, Mean Helmut, Nice Tommy and Mean Tommy lived in Zamzeewillie. They always seemed to be just out of sight in the other room. 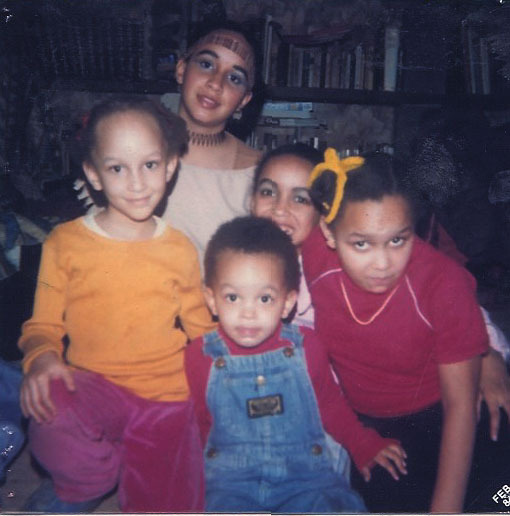 Since there are no known photos of this town and none of the Nice and Mean boys I will have to make do with a photo of Ayanna and James with siblings, in our living room in Excelsior Springs. L to R Tulani, James, Ayanna and in the back Jilo and Ife. I can’t believe it’s really over! And that I found streets and places for all the letters of the alphabet. Mostly 😉 I really appreciate Gould Genealogy.com for hosting the challenge. I don’t think I would have ever written so much about almost every street I ever lived on without it. You can find a list of the 39 blogs that participated here – Family History Through the Alphabet – the Finale. Woohoo, and Congratulations on completing the Alphabet Challenge. It has been fabulous to have you join us, and I have learnt a lot about places in the US that I had never heard of before. But more importantly, you have written down details and memories that have now been recorded for your family. Well done!! It does sound interesting, doesn’t it? Maybe life in Zamzeewillie was happening on another dimension right in my house and I just couldn’t see it. Such a fun post Kristin. I’ve so enjoyed travelling along the streets of your life, learning about you, your family and experiences which are so very different to mine. Thanks … and thanks also for showing interest and commenting on so many of my “Family History Through the Alphabet” blogs. Cheerio for now. I enjoyed visiting as many as I could as we went along. Everybody had a different take and I learned a bit, especially about Australia. Yes – love yr blogs and the alphabet. You have traveled so much around the county and experience so much – as yourself and family. So much more than most. Myself being of the military life style of moves, you still have done so much more. Your children must be so well rounded from this; and adventurous as their parents – this is a wonderful gift. Though can be very tough and trying at times, am sure they appreciate their parents choices, now looking back. The kids seem to appreciate the choices. Those they are aware of anyway. The 5 oldest seem to be at ease with moving around. The youngest grew up in the same place, moved to an apt and job when he was 17 and has been in the same apt for 7 years. CONGRATULATIONS on completing this challenge. I have to tell you that I am thoroughly impressed with all of the information and great photos you’ve shared –which made your family’s life come alive! You know, I started to join in on this challenge too. But it didn’t take me long to realize that I never would have made it past the letter E . . . if I did . . . LOL! What a fun post! Children’s imaginations are so rich–it’s awesome that memories of those times and places that were so vivid to them are being preserved. It would be interesting to get them to write down their memories of the places they remember. Our memories are probably a bit different. An absolutely perfect end to challenge. What a fun post! Thanks Fi! It was the easiest and fastest post of the series once I decided to just go with it.